Ability for jukeboxes to play automatically for discs in a queue. Poll: Should Music Discs Play Automatically? It gets really annoying to manually play and take out discs in a jukebox. 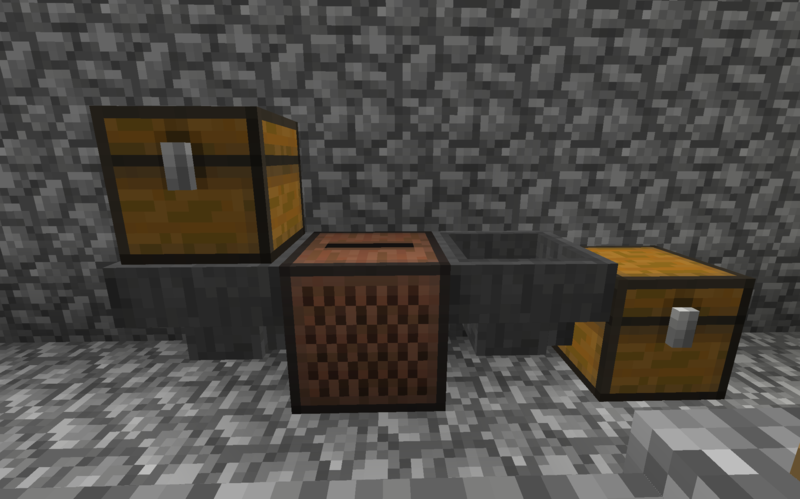 I think that you should be able to hook up a hopper and put discs in there and they automatically play and then once the disc is over it goes out the other end into a chest. I have a screenshot of what it might look like. What do you think? That's not quite what I was expecting given the title. But that's an interesting idea. And I certainly would enjoy a queue of some kind for jukeboxes. Support. Other than wanting the output hopper under the jukebox (to comply with standard hopper palcement rules), the base set-up looks fine. I would, however, prefer that player built RS circiutry (rather than a GUI in the juke box) control the playlist. I would prefer to have another functional block, the wire rack that specifically held the records. It could sit on top of the jukebox, and the jukebox could push/pull discs as needed. There is no need for a GUI or an additional useless block. Hoppers are a logical solution. However, the input hopper should be on the top (sides are fine ig) and the output should be a the bottom as ScotsMiser proposed. I think hoppers would indeed be brilliant to support for jukeboxes! Even if nothing else I think having redstone power to a jukebox should let it loop infinitely. The fact that jukeboxes are completely manual is why I almost never even so much as give them a glance in any circumstance and might only use them for comsetic details, which is a pity considering their potential.